The National Equine Welfare Council of Great Britain has taken a very big bull by the horns with the publication of welfare guidelines in the trimming of horses by persons other than registered farriers and veterinarians. The first-ever guidelines were published this week, and herald the opening of a 30-day period during which time trimmers and others may comment on the proposed regulations. 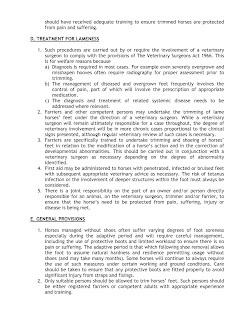 The two-page document speaks firmly to the need for painfree trimming of barefoot horses, while adding a proviso that newly-barefoot horses may be painful during transition. According to the guidelines, sore barefoot horses need to be aided with oversight "including the use of protective boots and limited workload to ensure there is no pain or suffering." The provisional text adds that "Care should be taken to ensure that any protective boots are fitted properly to avoid significant injury from straps and fixings." In what appears to be a victory for those making a living as hoof trimmers, the regulations stop short of specifying any sort of minimum training standards, examinations or registration for trimmers. Farriers, on the other hand, will still be required to complete college training and a four-year formal apprenticeship before being allowed to shoe a horse for pay. Under British law, only a registered (graduate) farrier may apply a horseshoe. Under the Farriers (Registration) Act of 1975 horse owners have the legal right to trim their own horses' feet, but may not put on shoes or attempt to change the shape of the horse's feet. The new regulations specify the involvement of a veterinarian in the treatment and management of horses with hoof disease or lameness, but the language is quite vague as to when a horse's hoof problems are considered lameness vs. superficial or mechanical defects or hoof capsule deformation that may cause pain or gait abnormality. The true acid test of the new guidelines will no doubt be the treatment of laminitis by hoof trimmers without veterinary supervision. Many claim to obtain excellent results on laminitic horses with changes in lifestyle, diet and judicious hoof trimming and dismiss the need for pain medication, radiographs and veterinary supervision. The new guidelines would suggest that trimmers should obtain precise interpretation of the new equine welfare violations if working without veterinary supervision. "Having a code of practice will allow the (equine welfare) charities to intervene at an earlier point when they see someone is doing work that should be undertaken by a vet or farrier," commented the British Equine Veterinary Association's Chris House, who is chairman of the NEWC's equine hoofcare sub-committee. These documents are part of a legal process and should not be altered. Please respect the posting of these documents for your personal information. 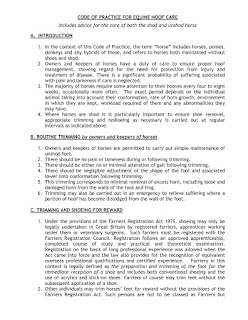 Remember that these are "in process" documents provided for comment and these regulations only affect hoof trimmers in the United Kingdom. Blogger's Commentary: It's not likely that any proposed regulations could please all parties. I'd interpret these rules as a victory for hoof trimming as an unregulated profession in a country where almost everything else seems to be regulated. As I read this document, it is also an endorsement of the value of hoof boots when fitted properly and a warning that improper use of hoof boots would be contrary to horse welfare regulations. Hoof Blog readers from Great Britain may comment to the NEWC using forms available on their website. Deadline for response is midnight, April 30, 2008.
regard the UK Horseshoers Union as a bunch of mouthy hotheads. expensive bureaucratic operation focused on self-preservation, rather than on animal welfare, which was the original intent of the farrier registration act. They are also very unhappy with the lack of enforcement of rules to which they have adhered voluntarily for years. "is the glass half empty? or is the glass half full?" sorts of questions. Remind me to tell you sometime about the Polish farrier who took a bus, a train, and I think even walked part of the way to France for a farrier meeting once. When he got there and saw all the tools and shoes, he couldn't handle it. Bernard Duvernay from Geneva took up a collection from all the exhibitors and they sent him home with a crate of new tools and shoes. The man wept. A few years later, he hosted a clinic in Poland (he's the FEI farrier for his country) and had Bernard come and be the clinician and see what he had done with the tools and how he had been trying to teach the farriers in Poland. It's a two-way street, as long as people work in the spirit of improving hoofcare the whole world over. Poland qualified for the World Cup in Dressage last week for the first time in eons. I like to think that the farrier industry people at that meeting in France had a hand in it. I read your comment, and I actually agree with most of your sentiments on this. Un-level playing fields eventually get bulldozed over, and that will happen in the UK. Having been involved in the WCF testing system, I certainly don't idealize the British system, nor does Chris Gregory, Doug Butler, or Mike Wildenstein. I do think that they have maintained a good standard, but their system is too rigid, with little benefit from all of the rules imposed on their working farriers. The WCF, at least, deserves a lot of credit for keeping the craft alive during the bad times after WW II when it almost disappeared, and that's one reason that I admire their work. UK farriers do plenty of mediocre work every day, FRC or not. As a famous orthopaedic surgeon once said: "The average orthopaedic surgeon is average. " The same applies to farriers.